For all those that suspected National are not so hot on democracy, this morning Key issued proof by publicly announcing his support for Egyptian dictator Mubarak on Breakfast. Stumbling and seemingly unable to pronounce the Iranian President Ahmadinejad's name, Key went on to discuss how important freedom and democracy were in New Zealand, a sentiment he clearly does not extend to other countries. The journalism in New Zealand has been nothing short of appalling, which is perhaps one reason why Key seems so confused (once again) on international politics. Call me a news snob, but I really don't care how Frank Bunce felt or, in what has to be one of the worst stories of all time, Anne Penketh's completely devoid of context piece on how frightened she was trying to get to the hotel. At least it's not as bad as the standard of journalism where - if this slide is to be believed - Fox News appear to have renamed Iraq as Egypt on the world map. One sign that Key is seriously off the mark in his comments on Egypt is that even US politicians are speaking more delicately than him. Obama's administration has pledged their support for Mubarak, but stated that he needs to deal with the protesters democratically. Key is right that the Egyptian protests will upset Israel, but has made no mention of the oppressive dictatorship that has characterized Egyptian politics for the last 30 years. In Key's mind, he would rather they stayed that way. The protesters are by and large not violent; this is a myth being propagated by western media coverage. They were led by young people inspired by the events in Tunisia. As the photo that begins this post demonstrates, one of the forms of resistance that is repeatedly coming out in photos from the region is that protesters have been kissing riot police. In the face of a strong Government response that has included shutting down Twitter, Facebook, cellphones, kicking out Al Jazeera, and reportedly cutting landlines soon, the struggle continues. These are ordinary people on the streets; the protest is not being led by the Muslim brotherhood as some news sources are insinuating. Sure some protesters have taken up stones, but eyewitness accounts converge in saying that this is a later development in response to the American tear gas that has been repeatedly fired at them. 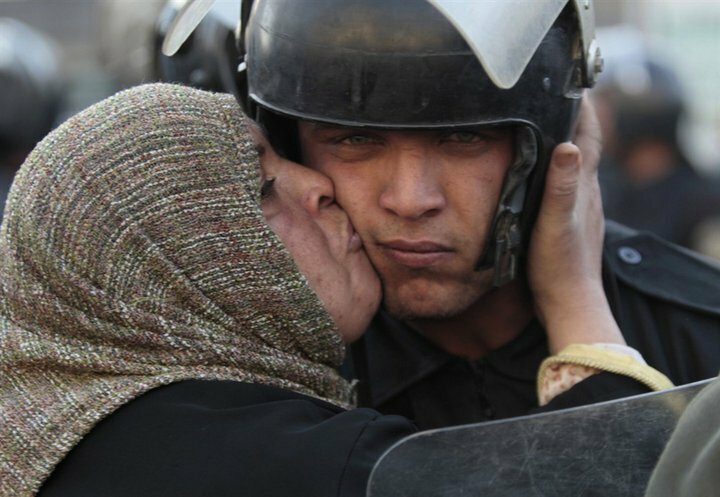 With at least 100 dead, thousands injured and reports coming out of tortured corpses being dropped on the street by those suspected to be Government, Mubarak could do the people of his country a massive reduction in violence by kissing his undemocratic rule goodbye. Instead he has deployed F16 fighter jets, a move that our Prime Minister clearly supports. Soumaya Ghannoushi writes a great piece for Al Jazeera on why such complete misconceptions on the region circulate so widely, called The Propagation of Neo-Orientalism, a piece that references influential cultural studies scholar Edward Said's most influential work. Ghannoushi points to some frightening impacts that these heavily spun news reports are having on people's general knowledge (most notably, only 9% of BBC and ITN viewers knew that when the phrase 'occupied territories' was used it referred to the Israelis as occupier, most thought that the Palestinians were extending their settlements into Israeli territory). The spin in the US media is currently that the protesters are violent and undemocratic, as covered by Phillip Weiss in this piece. Obama is avoiding using the 'D' word (and I mean democracy) as the US begins to worry about what the impact of having movements towards Arab democracy will mean to their arms exports. While Key's idiocy might pay tribute to his lack of knowledge on North African politics, one has to wonder if he gets any foreign policy advice before he shoots his mouth off. The reason why even Hillary Clinton is cagey is that the current events in this region threaten the current power balance of the US's economic interests in this region. The US has been pretty keen to support dictatorships in this region in the past, despite their loud cries of bringing democracy and freedom to the Arab world. One thing that looks certain if Mubarak goes (and he is likely to) is that the country will sever their economic ties with the US, who currently supply all the weapons that are being used on the people of his nation. The US also curiously just committed to a US$50 billion arms deal with Saudi Arabia despite it being the home of Wahhabism. Such deals might be increasingly under the scrutiny of the populous, which is hardly a bad thing in the face of countries that disguise their lucrative arms trades under the guise of pretty public relations. The revolutions in Egypt and Tunisia which have prompted demonstrations in Yemen, Lebanon and Algeria show the significance of this movement. The fact that they are being fueled by the release of the Palestine Papers on Al Jazeera and The Guardian that reveal Palestinians weak in the face of Israeli and US pressure signals a potential shift in the geopolitics in the region. If Obama and Clinton can recognize this, why can't Key? UPDATE: US Secretary of State Hillary Clinton has now said that she expects democratic elections will come out of the uprising for Egypt. So why does Key support Mubarak and say that the protesters are causing unrest? You should right more on the blog! Funny how the Right all were bellowing support of the 2009 Iran uprising, and now decry this one. When we have knowledge the people cannot be kept down. I think the Islamic Enlightenment (long overdue) will come quicker than we think. Who on the right is decrying this action by the Egyptian people? I think trying to link John Key's statement made on television to him giving Hosni Mubarak unqualified support and being opposed to Democracy in egypt is a very long bow to draw. As far as i am aware no mainstream media in NZ has taken this up. It is only a few bloggers from the left who have decided that his words meant something that noone else seems to have taken them to mean. I hope the Egyptian people are able to grasp hold of the opportunity for freedom, unlike the Iranian people who were denied the same opportunity by the Islamist theocracy running that country. Who supported the Iranian theocracy in Iran? Well as far as I can tell your fellow blogger Mr Bradbury does. However beyond that you have your usual line up of Third World despots and extremist groups. Gosman, I'm talking about the CIA's role in the overthrow of Mosaddegh's government in 1953. I should have added Bahrain, Saudi Arabia, and Libya all support Key's opinion of Muburak. I think trying to link John Key's statement made on television to him giving Hosni Mubarak unqualified support and being opposed to Democracy in egypt is a very long bow to draw. Key: The New Zealand Government wants a peaceful outcome to this. In the end, whoever governs your country is a matter for the citizens. And in the case of Mubarak he’s been there for a long time, 30-odd years. We respect the fact that he has done his very best to lead a country which has recognised Israel and, therefore, has wanted to make sure the position in Middle East has been a peaceful one. It’s not easy, it’s very complex, and there’s a lot of emotion. Dann: Are you calling for him to go? Dann: I guess the concern is the Muslim Brotherhood. The potential for an Islamist movement to come in and fill that vacuum. Is that the concern? Key: Well, the concern is that there are some nations that simply do not recognise Israel. And, taken to the extreme, in Iran, Ahmadinejad has said he basically wants to see Israel wiped off the face of the Earth. So, it’s a very serious situation. Egypt’s provided stability and leadership and calmness. Obviously, the hope always being that that position would spread across the Middle East, that it would be possible to broker a two-state solution, with recognition of Palestine as well but this certainly looks like it’s taking things, potentially, in the wrong direction. As far as i am aware no mainstream media in NZ has taken this up. ...I've emailed 4 news sources asking them to explain their self censorship and am posting their replies or lack of them up. Well as far as I can tell your fellow blogger Mr Bradbury does. Are you ever able to come on this blog and not put words in my mouth? You don't seem to have a problem with ascribing views to other people so I don't know you have a problem when you perceive someone doing it to you. I at least can provide evidence where you defend the democratic creditials of the Ahmadinejad's regime in Iran or do you deny making statements to that effect during the last Presidential elections in that brutal Islamic theocracy? The CIA's role in the overthrow of the Mosaddegh's government in 1953 does not mean that America supported the subsequent hijecking of the Iranian revolution in 1979 by an undemocratic Islamic theocracy. To try and argue that is not logical. It would be like claiming that the West's war time alliance with Stalinist Soviet Union in the 1940's meant that the US supported the brutal invasion of Hungary in 1956. One does not necessarily mean the other. You don't seem to have a problem with ascribing views to other people so I don't know you have a problem when you perceive someone doing it to you. No you twist, lie, manipulate and that's why I don't bother feeding the troll when it comes to you Gosman. I at least can provide evidence where you defend the democratic creditials of the Ahmadinejad's regime in Iran or do you deny making statements to that effect during the last Presidential elections in that brutal Islamic theocracy? And this is the perfect example of you twisting things, I was talking about the Guardian article pointing out that Ahmadinejad probably won the elction, the article is here and my point was that Ahmadinejad was a hardliner elected because America had parked two armies either side of him. My point being that he is a result of American aggression, attempting to twist my point into legitimizing his regime is the kind of manipulations right wing trolls play. ...let me get this straight - are you pretending to not understand why the Islamic revolution took place? You claim the CIA didn't intend for the Islamic Revolution to happen - WELL DUH GOSMAN - REALLY? Of course they didn't, the point is that the Islamic Revolution happened BECAUSE OF THE AMERICAN CIA COUP - it was a RESPONSE to the coup, you do understand that right? People become radicalized under oppressive regimes, that's why you shouldn't create oppressive regimes and prop them up. Of course you know all this you're just playing Troll again. It's a pity we don't have Wikileaks cables from that period in Iran for you Gosman, but we do have them relating to the American backed Dictators currently being overthrown - and who knows how it will transpire - possibly even replaced by Islamic Theocracies. And these provide a precedent and confirm a foreign policy we are already all to aware of, except you bought the spin didn't you Gosman. On reflection Gosman, I was a little to harsh on you. My points on Ahmadinejad were to argue that it was America's saber rattling that was inspiring the hard line response, I certainly do not endorse the heavy handed measures his regime implement. The Islamic revolution was caused by the CIA coup, as people under a puppet regime tend to demand self determination and that was an example of blowback. If we oppress people, they tend to become radical, the way we need to disarm that radicalization requires diplomacy and good will, not putting two standing armies either side of your enemy, that only gives support to the worst elements of more radicalization.